Palm Sunday is the Sunday before Easter, Christianity’s most important day. Palm Sunday celebrates Jesus’ triumphant entry into Jerusalem on the back of a donkey. Great crowds of people lined the streets waving palm branches to welcome Him. 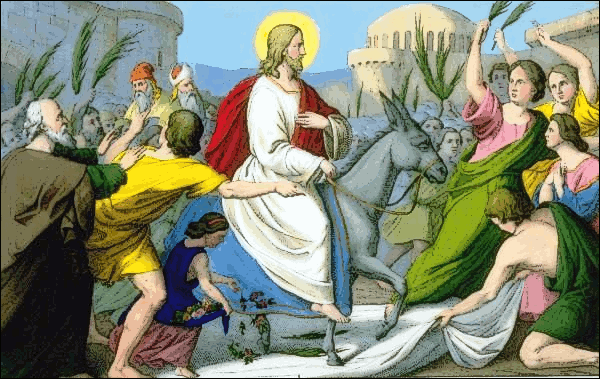 The people shouted “Hosanna” and laid their cloaks, flowers, and palms on the path in front of Him. In many Christian churches, Palm Sunday is marked by the distribution of palm leaves to the assembled worshipers. The difficulty of procuring palms in certain places led some churches to substitute boughs of yew, willow, olive, or other native trees; thus Palm Sunday is also known as Branch Sunday. Pope Francis celebrated his first Palm Sunday Mass in St. Peter’s Square at the Vatican earlier today, encouraging people to be humble and to lead simple lives, as thousands of onlookers waved olive branches and palm fronds at the start of Holy Week. Since his election on March 13, Francis has put the downtrodden and poor at the center of his mission as pope, keeping with the priorities of his Jesuit tradition. His name is inspired by St. Francis of Assisi, who renounced a life of luxury for austere poverty and simplicity to preach Jesus’ message to the poor. Pope Francis remarked that his grandmother used to say, “burial shrouds don’t have pockets,” meaning “you can’t take it with you.” Francis explained that Christian joy “isn’t born from possessing a lot of things” but from knowing Jesus. That same joy keeps people young at heart, he added. Visit http://ministry-to-children.com/palm-sunday-lesson for a Palm Sunday Bible lesson. Palm Sunday printables and crafts for kids can be found here: http://www.dltk-bible.com/crafts . Did You Know…? Pascua Florida is a Spanish term meaning flowery festival or feast of flowers. The term originally referred to Palm Sunday and was later applied to the whole Easter season. The state of Florida was given its name in 1513 when Spanish explorer Ponce de León first sighted the land at Easter time. This entry was posted in 200 Religion and tagged Christianity, easter, Palm Sunday. Bookmark the permalink.